So worrying about radiation from a corpse 8 miles away is more important than the commandment to not put a plastic bag over your head? Funny, but no, I wouldn’t say so. 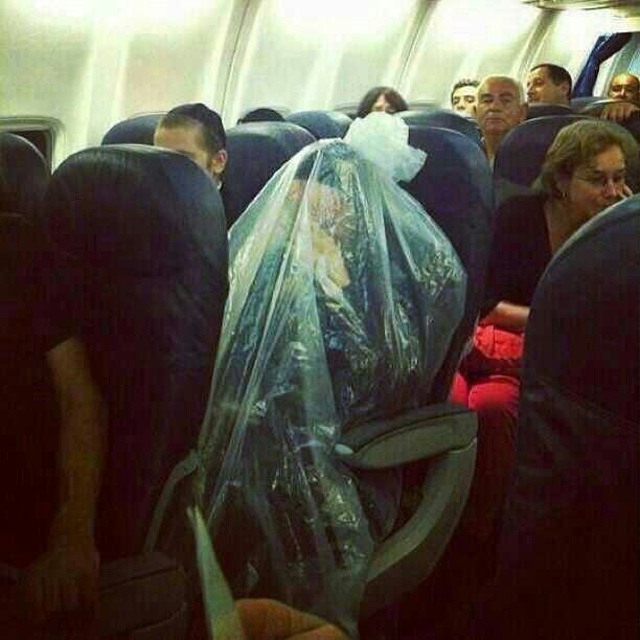 If there were a commandment that prohibited a person from sitting within a thick plastic bag, then this would not be touted by anybody as a “solution” to the problem of flying over major Jewish cemeteries. But any stipulation to that effect is merely a byproduct of the prohibition of placing yourself in mortal danger, which is one that doesn’t come into effect when the bag has air holes punched into its side. I don’t see any holes in that bag. This is sort of Exhibit A as to why I am not, nor will I ever be, orthodox. It is beyond silly. I think that this behaviour seems crazy by the standards of most people because 1) the man is following a law that isn’t just moral and practical, but also ritual, and 2) because he believes it was actually revealed by our Creator rather than just seeming like a nice thing to follow. His attitude and choices are therefore out of step with others who aren’t living in that mindset. I’m not saying I would do this if I were him, but I’m not him so I don’t know. I’m also not saying there are never dangers to extreme over the top versions of religion, both spiritually and socially. But still, the level of integrity is impressive to me and I notice that.